Khartoum / Kassala / New Halfa / El Gedaref / Kauda / ED Damazin / El Gezira / Northern State — Yesterday, thousands of Sudanese demonstrated in eight different cities in the country for the fourth consecutive week of the Sudanese uprising demanding the immediate step-down of President Omar Al Bashir and his regime from power. The demonstrations came hours before the start of the peaceful march in Khartoum at 1 pm, moving to the Presidential Palace to demand Al Bashir to step down. On Wednesday, Kassala in eastern Sudan saw mass demonstrations in response to the call of the Sudanese Professionals Association. Witnesses from Kassala told Radio Dabanga that the demonstration started from the public station despite the heavy security deployment. The authorities used emergency measures to evacuate the station of the vehicles and close the shops in the market. The witnesses said that the demonstrators chanted slogans 'just leave' and 'peaceful against the thieves' before the security forces and masked men wearing civilian clothes faced the demonstrators by firing live ammunition, tear gas, brutal beatings and a large-scale arrest campaign, which led to the dispersion of the demonstration to several marches within the city market. The witnesses pointed out that one of the marches managed to reach the military garrison, while march proceeded to the headquarters of the Legislative Council amid cries for the overthrow of the regime. Police forces stormed the Deim Baker secondary school in El Gedaref after a sit-in to demand the release of teacher Abdelwahab Ibrahim who was arrested from inside the school last week. Students from El Gedaref told Radio Dabanga that the police assaulted the protesting students and surrounded the school in anticipation of any demonstrations. On Wednesday, residents of Kauda in South Kordofan which is under the command of Sudan People's Liberation Movement-North (SPLM-N) marched in support of the uprising of the Sudanese people to overthrow the regime and the peaceful demonstrations being launched across the country. Jabir Komi, the spokesman for the SPLM-N told Radio Dabanga the demonstrators and civil society leaders handed over a memorandum to the regional leadership in which they confirmed their support for the December uprising demanding Al Bashir and his regime to step down and hand over power to the people. They also called for the release of detainees and allowing citizens to demonstrate peacefully. On Wednesday, a group of lawyers and jurists in Blue Nile state carried out a sit-in in front of the court complex of the capital Ed Damazin in protest against the use of violence against demonstrators. Lawyers waved banners calling for the release of detainees and denouncing violations of the Constitution, this along with calling for an immediate end to violence against peaceful protesters and allowing them the right to organise demonstrations. Yesterday, hundreds of residents of El Managil in El Gezira went out in a mass demonstration demanding the immediate step-down of Al Bashir and his regime from power. Witnesses told Radio Dabanga that the demonstration broke out in the market and continued for nearly an hour during which demonstrators shouted slogans calling for the overthrow of the regime. They pointed to the closure of all shops and pumps together with the spread of security forces amid the insistence of young people to demonstrate at night. Yesterday, the residents of Um Odam area southwest of El Hasahisa locality in El Gezira state went out in a mass demonstration demanding the step-down of Al Bashir and his regime from power. The demonstrators raised banners read: "Um Odam against the government of poverty and hunger, Just fall". 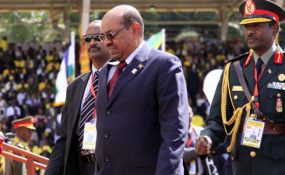 Yesterday, the residents of Shour in Gali locality in White Nile state demonstrated demanding the step-down of Al Bashir and his regime from power and handed over a memorandum of their demand to the Shour police station. Yesterday, the students of Amri secondary school in the Northern State went out in a demonstration demanding the overthrow of the regime, which the security forces confronted with the arrest of two students and taking them to the buildings of the apparatus. Witnesses told Radio Dabanga that yesterday the students came out of school to demonstrate and the security forces confronted them in front of the school gate before entering the street and arrested students Mousa Siraj and Mohamed El Naeem, which angered the residents of the town, who gathered in front of buildings of the security forces demanding the release of the students.